1. Raices Ocultas, Oscar Moscardini. 4. Seis Milonga, Ernesto Cordero. The ability to hear music while dreaming, to extract music from the “astral plane” while dreaming and the ability to vividly remember upon waking. 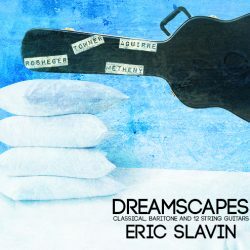 DREAMSCAPES is Eric Slavin’s second solo album, where he explores the music of Pat Metheny, Raplh Towner, Carlos Aguirre and other dreamscapers via Classical, Baritone, and 12 String Guitars. Eric Slavin was born on a United States Marine Base in Hiroshima, Japan. He is a bilingual (English and Spanish) professional guitarist and teacher. He comes from a musical family, and his grandmother, Elena Slavnaia was a celebrated soprano singer who sang at the Steinway Concert Hall in 1931. 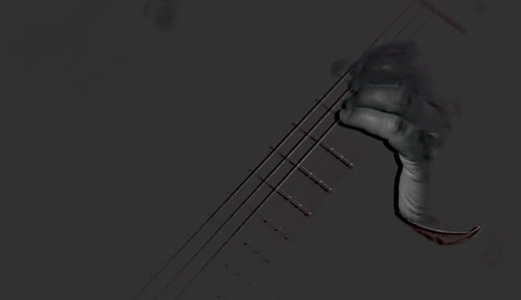 Eric’s musical aspirations started as a child studying piano under the Hungarian pianist, Agi Rado. He later studied guitar and music most notably in Washington, D.C. under John Marlow, Jerzy Sapieyevski and Haig Mardirosian. In 1988 he was an intern at the Hector Villa-Lobos Library and Museum in Rio de Janeiro, Brazil. In the ensuing years he had the privilege to study with well-known Latin American guitar pedagogues and composers such as Abel Carlevaro and Guido Santorsola. 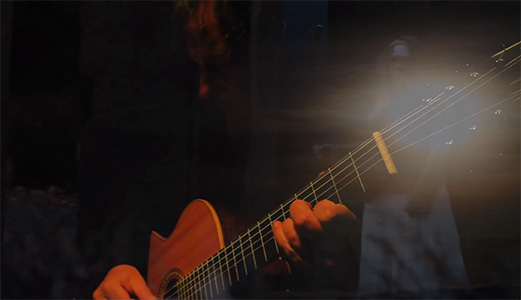 Eric is a founding member of the award-winning Santa Fe Guitar Quartet from Argentina which has toured the world for 25 years including performances at Carnegie Hall and Lincoln Center here in the US. Eric is a graduate of The American University, Washington, D.C. and has a Masters Degree in Chamber Music from New Mexico State University. Eric has two solo CDs, Serenade (2010) and his new CD entitled Dreamscapes which is a collection of songs realized in dreams from composers throughout the world. This CD is dedicated to the greatest guitar dreamscaper of recent memory, American composer and guitarist Philip Rosheger. Without doubt, Philip had the gift of dreamscaping. A good many of his compositions for solo guitar were written in this manner, including the works found on this disc. During the preparation of this recording Philip passed away suddenly in December of 2013. He was aware of my recording project and enthusiastically approved of the other composers on this CD, especially Ralph Towner and Pat Metheny. It is my hope that this recording will especially find its way to those who hear music in their dreams. 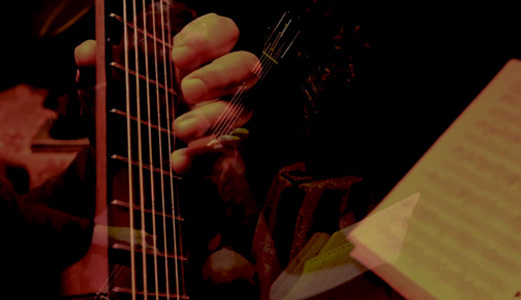 All the songs on this recording were originally written for guitar, and may be unfamiliar to the listener simply because they have not been recorded by the well known classical guitarists of our time. With this CD I hope to bring a greater awareness of this repertoire to a wider audience, and to pay homage to the talent and artistry of these fine contemporary guitarists and composers. 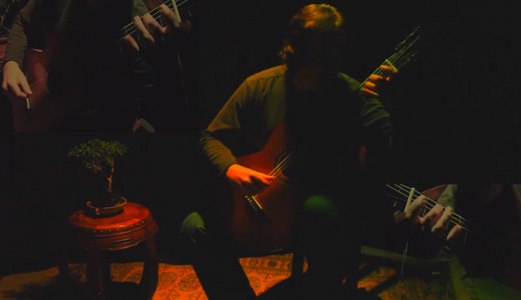 The lovely 1994 song Serenade by American composer and guitarist Philip Rosheger (b. 1950) came to him suddenly while improvising during a performance. Mr. Rosheger says, “This piece seems to have universal appeal and has made its way around the world, thanks to the Internet. I have always encouraged people who play my music to take liberties and make each piece their own, and Eric Slavin’s version clearly treats it with great care, allowing it to breathe freely.” The simple beauty and elegance of the melody speaks directly to the heart, which is why I entitled this CD Serenade.